As you sail up on your super yacht to the island of Sardinia, you are immediately impacted by the striking contrasts of the landscape. The rolling mountains are punctured by scalloped bays filled with snow white sand, all engulfed in the inconceivable blue of the Mediterranean Sea. The juxtaposition doesn’t end with the scenery as Sardinia has some of the Med’s hottest nightlife adjacent to a unique tranquility afforded by tiny coves and hidden beaches. Explore one of Italy’s greatest treasures just off the coast of the Italian peninsula for a Mediterranean experience you can’t miss. Combining glamor with a laid-back cool Porto Cervo is Sardinia’s hub of life with mouth-watering restaurants and high-end shopping. 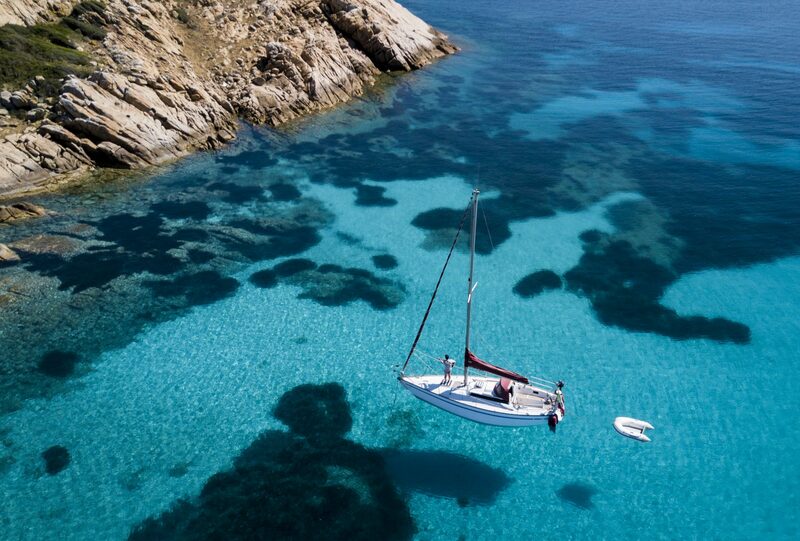 Costa Smeralda, the Emerald Coast, lies in northern Sardinia and is known for its extravagance so enjoy the bustling town before meeting the yacht. Relax and have cocktails as you cruise the coastline. In the afternoon, hit the green at Pevero Golf Club or enjoy a spa treatment at the popular Hotel Cala di Volpe, then enjoy an afternoon aperitif. As the sun sets, head for Phi Beach or the uber-fabulous Billionaire Club to dance the night away with the glitterati. Cruising south, you’ll find the tiny resort community of Porto Rotondo. With substantially less tourists than its neighbor sit in the Piazzetta San Marco for a morning coffee with locals and fellow yachters. Continue your peaceful excursion by sailing to a petite cove with private more intimate beaches. Less haute than Porto Cervo, Porto Rotondo has a more relaxed atmosphere, but still offers luxury. Hotel Sporting’s local seafood dishes and impressive wine list make this spot a must-visit. As you continue to cruise southeast, you’ll be enamored by the beauty of Cala Luna. Craggy limestone cliffs covered by dense greenery plunge into the aquamarine waters. Early risers are rewarded by the surreal view created when the sun rises and illuminates the coastal caves. Created by a landslide in 1962, Cala Goloritze is one of Sardinia’s most beautiful beaches. Featuring numerous other beaches mixing smooth white pebble and sand, explore the white crescent of Cala Luna and discover the wonders of the cave-pitted cliffs. The best way to arrive in Cagliari is by sea. Cruise into the island’s capital for a view of the town’s medieval architecture in “old town” Il Castello contrasted against the contemporary harbor. An archaeology museum in town will transport you as its home to the Nuragic complex, 4,000-year old stone defensive structures found only in Sardinia. If history isn’t on the menu, enjoy some local shopping on Via Roma and Via Manu. Originally a mining heartland, the abandoned mines are now home to various museums and visitor attractions. Visit Forte Village Le Dune for a relaxing day at Thermae de Forte, a Leading Spa of the World. If you’re itching for more excitement and have young children a stop at Leisure Land is necessary. Filled with activities like go-karting, ice skating, and bowling it’s fun for the whole family. Before you set sail take in the spectacular views of the Italy’s highest sand dunes at Le Dune nearby. Continue cruising Sardinia’s coastline, dotted with tiny towns and cozy coves, and you will come to the Sardinian Islands. Sant’Antioco, the larger island, and San Pietro-Punto di Cala Fico are wild and ruggedly beautiful with deep waters and high cliffs. Charters with children will want to stop at Forte Village Le Dune. Not only does it boast the Thermae de Forte, a Leading Spa of the World, but also go-karting, ice skating, bowling and more can be found at Leisure Land. Be sure to stop at Le Dune, located close by, which is home to Italy’s highest sand dunes — a spectacular sight. Continuing up the west coast of Sardinia, you’ll stumble on Alghero. The Catalonians left a distinct impression on this town which can be seen through the architecture and the culture. Walk along the cobblestone streets to the centro storico and stop for lunch at a restaurant where the menus are often written in both Italian and Catalan. During the day venture into the Grotte di Nettuno, a cave full of stalactites, which are essentially icicles protruding menacingly from the ceiling in an impressive natural feat. Wine lovers will rejoice as Alghero is home to a bevy of impressive vineyards. Enjoy a wine tasting before dinner in this beautiful old town. One of Sardinia’s better kept secrets, La Maddalena was declared a national park in 1996 and has fewer tourist footprints than other destinations along the coast. Part of an archipelago comprising of 6 other islands, fest your eyes on the grey-pink granite rocks, thorny macchie and miles of pine forest standing above some of the best beaches in Sardinia. On Razzioli you will find a blush pink and beach coyly awaiting. Anchor offshore and take a tender to explore.